I have been for the last six month advising and guiding masters students at the Gaming Design department of the Utrecht School of the Arts in Holland, supporting them both in their final year projects and their supportive narratives (thesis). “The Big friendly Giant”, a project by two of my students, David Smit and Joeri Lefevre, was an interesting project in research, goals, concept and process of development. Sophie and the Big Friendly giant; the main two characters developed for the Children’s target group, age 7 to 9. By David Smit- Utrecht School of the Arts. The Project aimed at creating a fictional franchise around the “Big Friendly Giant”, the children’s book written by Roald Dahl and illustrated by Quentin Blake, first published in 1982. Franchising is becoming very common in the Gaming industry, almost every successful video game becomes a full franchise. The need to think of the possibilities of franchising, right from the beginning of the conceptual and design process, becomes a pressing issue should the large and varied target group of a future franchise is to be properly reached. The goal of the project (and the research behind it) was then to create a user centered visual franchise development model that on one hand emphasize more on user involvement (hence on validated design decisions); and that on the other hand set clear guidelines on how to define clear visual design principles that allow unlimited growth of the visual design into different medium while insuring always quality and coherence of products. Preview from the products developed as part of the fictional Big Friendly Giant Franchise. 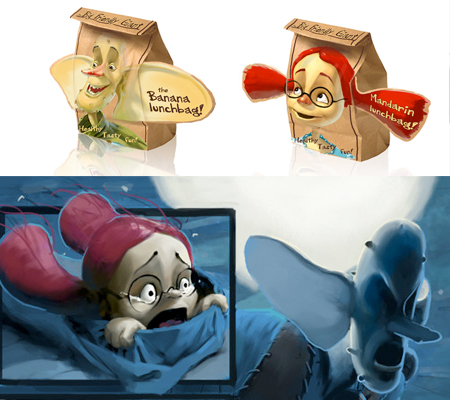 Lunch Bags and Comic book based on defined Visual and illustration Style. The project became then the case study for the franchising model created. The students decided to define two very different target groups to address while developing the project: Children of the age of 7 to 9 and adult gamers. They conducted then a comprehensive research on both target groups, with working sessions with children in primary schools, giving them as users the ability to express their views and ideas on the Big Friendly Giant story and taking their input as a main inspiration for facts leading to design decisions. 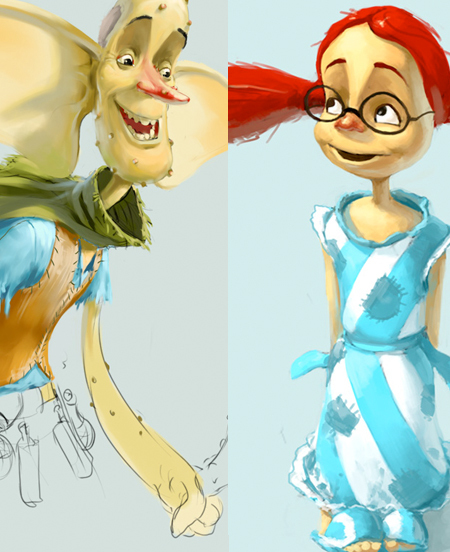 Similar research was conducted on adult players, and eventually each of the students developed the visual guidelines for each of the target groups: Joerie defining a simplified expressive style for the children; and David defining a dark explicit style for the adult gamers. Eventually, both students exchanged the target groups and each created a set of products based on the visual identity guidelines defined by the other, in order to test as well the efficiency of their defined visual styles. A comic book, Lunch pack, and a Nintendo DS game were designed for the Children. 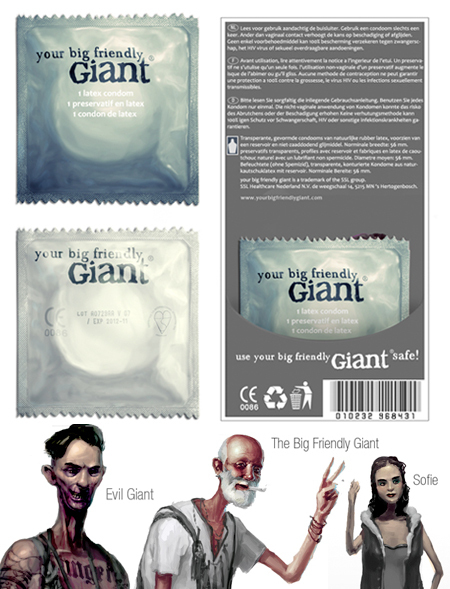 For the adult gamers, a comic book, an energy drink, and a condom package were designed as part of the franchised products of the Big Friendly Giant. Some previews are shown in this post of the end result of this project. Each year, I am asked by Print magazine to nominate three young designers for the magazine’s yearly prestigious “20 under 30” competition, a selection of some of the most talented upcoming visual artists worldwide. I have given my votes for this year for Joeri Lefevre and David Smit, for their wonderful work on this project that effectively combined research, theory and practice in Visual Design for the gaming industry.